Slavery was a fact of life in the South before the Civil War. My family on my mother’s side is predominantly Southern, having traveled the traditional migration routes from Virginia and North Carolina to Georgia and Tennessee, Alabama, Mississippi and ending up in Texas. Some of my ancestors owned slaves. I will never forget an incident that happened about ten years ago, when my ex-husband, who was in the Coast Guard, was stationed in North Carolina. Our Coast Guard station was small. When a family was going to be transferred, the wives all went out to lunch. When a new family came to the base, all the wives invited her to lunch. So it transpired that our leaving coincided with another family’s arrival, so our lunches were combined. I never met the woman’s husband, who was actually the one in the Coast Guard, and her name escapes me now, but I remember she said she was from Georgia. I told her I was too; I had gone to UGA. I asked her where in Georgia she was from. She told me there was no way I’d have heard of it, it was such a small town. I told her to try me. She told me from Maxeys. Well, I actually did know where Maxeys was, you see, because my ancestors in one branch of the family hail from Oglethorpe County, which is where the small town of Maxeys, Georgia is located. When I told her this, she asked my ancestors’ last name. I told her it was “Cunningham.” The look on her face spoke volumes. She was very quiet about Maxeys and Georgia and my ancestors for the rest of the meal. It was because the Cunninghams she had known in Maxeys were African-American. I think sometimes genealogists do not like to confront negative elements in their ancestors’ pasts. It can be difficult to learn that a revered grandfather was in the Ku Klux Klan, as Joe Chapman of the Amarillo Globe News recently discovered (free registration required or use Bug Me Not). It is important to remember that people have always been a complex blend of good and evil, and I don’t think that discovering your ancestor did some things you’re not too proud of necessarily negates the good things you’ve learned about him or her. I recently wrote about my great-great-great-grandfather, Johnson Franklin Cunningham. I’m going to tell you about another Johnson Franklin Cunningham. Here he is, pictured below with my great-great-grandfather Amos Blakey Cunningham (click to see a larger version). 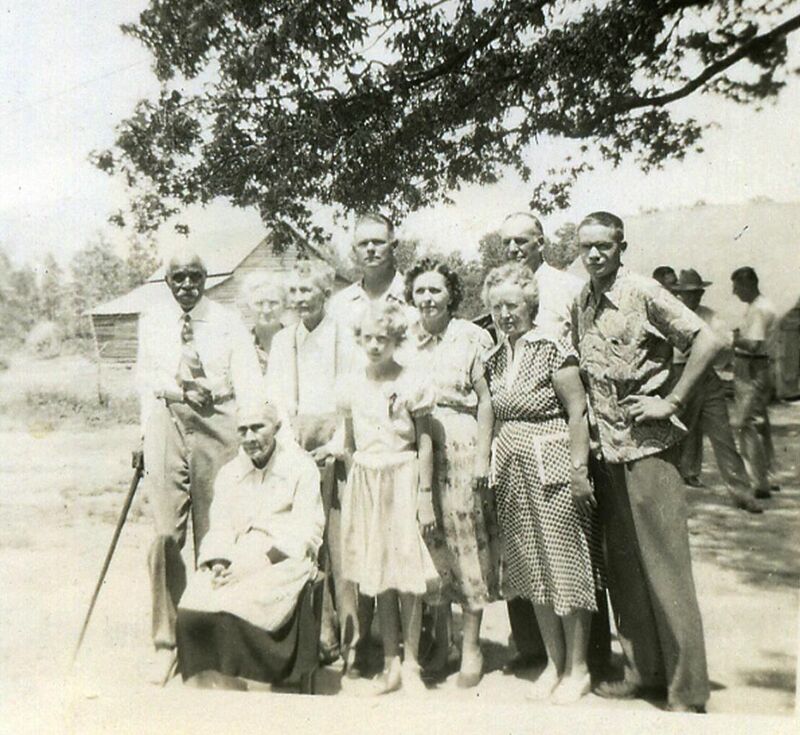 This photo was taken on August 10, 1952 at a family reunion in Oglethorpe County, Georgia. 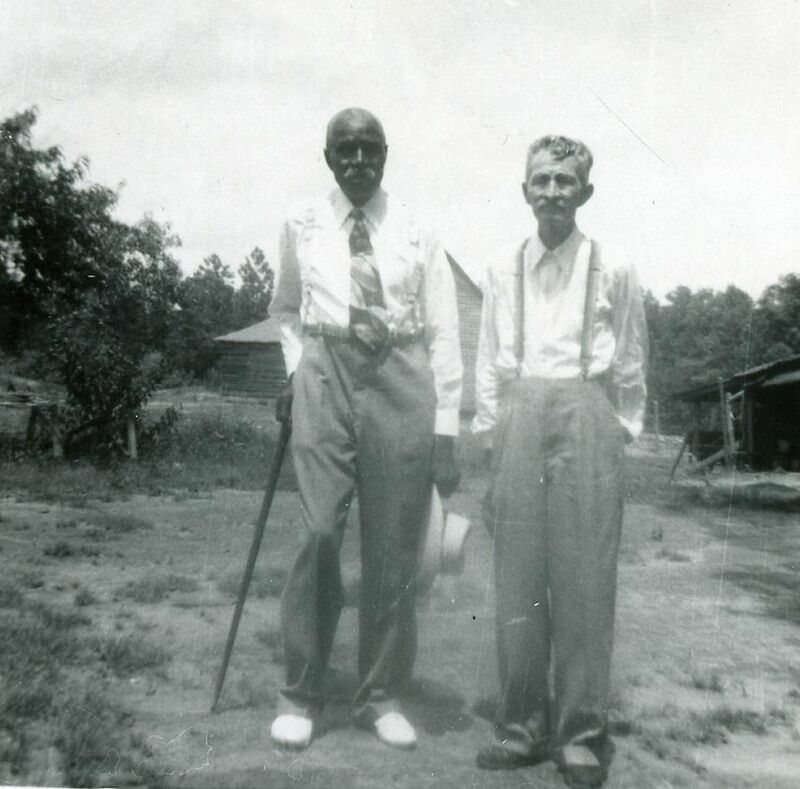 My great-great-grandfather Amos returned to Georgia to visit his sister and see his former home, which he had not seen in 70 years. Johnson Cunningham was a childhood playmate. At that time, he lived in Lexington, Georgia. I decided to see what I could find out about Johnson Franklin Cunningham. I located him on the 1880 Census with his father James and mother Charlotte in the Grove Creek area of Oglethorpe County, Georgia. The census was enumerated on June 11, 1880. I was unable to locate him (or his parents) on the 1870 census, but I do believe he had been born by the time the census was taken. In 1880, he was 11 years old and worked on his family’s farm. 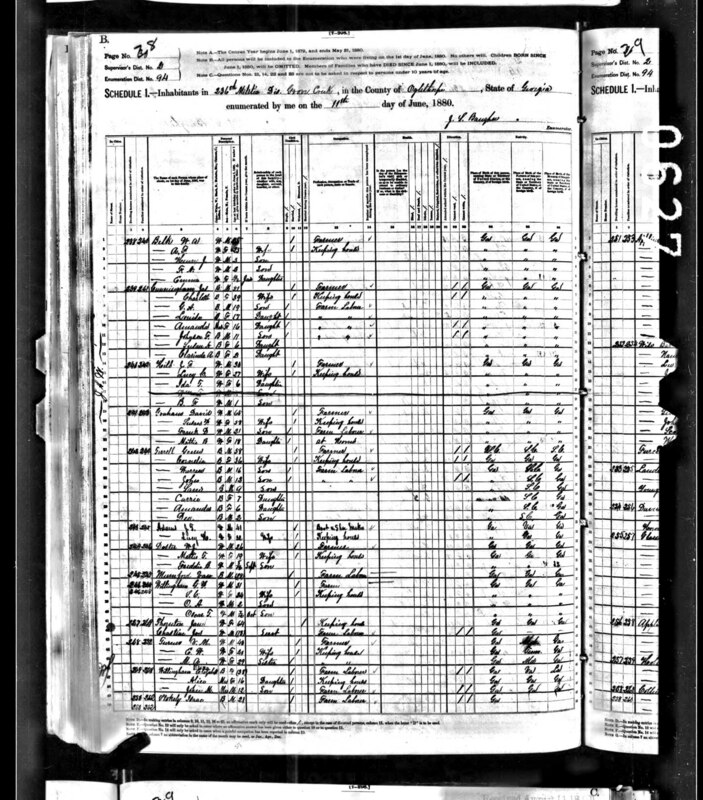 If you click on the thumbnail of the census image below and scroll down to line 6, you will find his family. I was unable to locate him on the 1900, 1910, or 1920 Census, but I don’t believe that he moved. I don’t know whether this is true or not, but I suspect that racism may have played a part in whether or not Southern census-takers were diligent about counting African Americans. At any rate, I found him again in the 1930 Census with his wife Eliza in the same area — Grove Creek, Oglethorpe County, Georgia. This census was enumerated April 14 and 15, 1930. 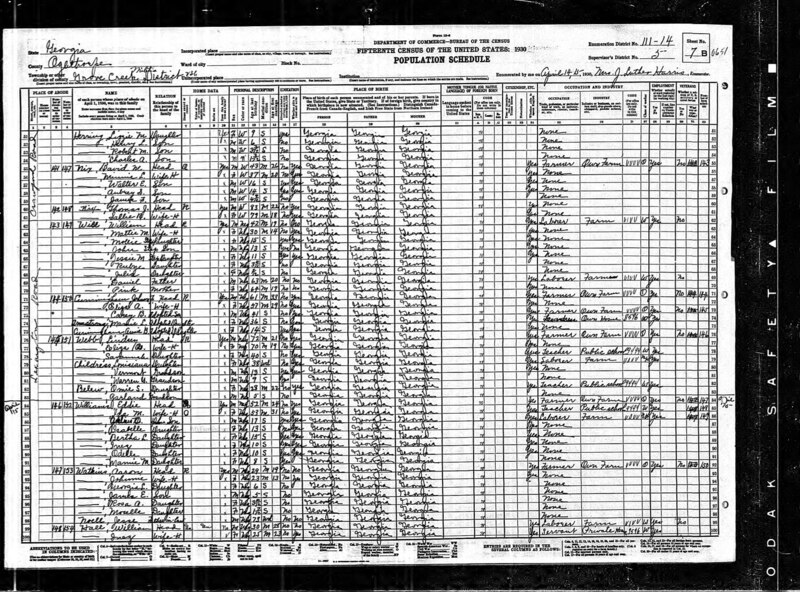 What I was able to learn about him from this census is that he was 61 years old, owned a farm, could read and write, had an adopted son named Carey B. Cunningham and two adopted daughters named Mamie Armstrong and Annie B. Cunningham, and lived on Lexington Road. He probably married about 1902 to Eliza. The entire family was born in Georgia, and both Johnson and Eliza’s parents were born in Georgia as well. If you click on the thumbnail below and scroll down to line 71, you will see Johnson Franklin Cunningham and his family. Given that Johnson Cunningham’s age in 1880 was 11 and in 1930 was 61, I believe he was most likely born in some time between June 1868 and June 1869. Family members believed him to be 81 to Amos’s 80 years of age, but if his age on the two censuses is correct, then he would have been 83 when the photo above was taken. This would indicate that Johnson F. Cunningham was born in 1868, which would seem to match the information found on the censuses. In fact, it would seem likely that if all three documents are correct, then Johnson Cunningham was probably born between June 11 and October 13, 1868. 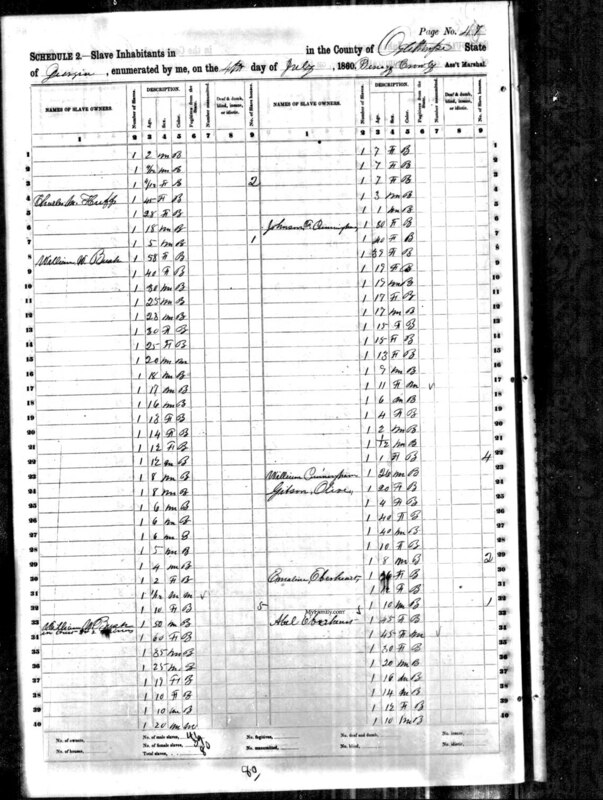 Assuming (and this is a big assumption) that the U.S. Census lists the correct ages for Johnson F. Cunningham’s parents James and Charlotte Cunningham, then James Cunningham would have been about 31 in 1860 and Charlotte Cunningham would have been about 19. According to the 1860 Slave Schedule above, there is no male of that age, but there is a 19-year-old female. This may be Charlotte. There are also other candidates close in age. Another piece of circumstantial evidence is that James and Charlotte Cunningham had a daughter named Louisa in the 1880 Census. It is possible that James Cunningham was not one of Johnson Franklin Cunningham’s slaves; the Cunningham family in Oglethorpe County was large even at that time. However, it does seem likely that Johnson F. Cunningham’s mother Charlotte Cunningham was owned by my great-great-great-grandfather Johnson Franklin Cunningham prior to the Civil War. There are no Cunningham slave narratives (that I could find) at either Oglethorpe County’s Gen Web site or Ancestry.com, but it is possible there may be other documents available in Oglethorpe County libraries or another good genealogy library. I have to admire African-American genealogists who are able to trace their family histories. It’s a daunting task in the face of so many holes and incomplete or uninformative records. I’ll close with a second picture from the family reunion. This picture features, from left to right in back, Johnson F. Cunningham, Dessie Cunningham Gray (Amos’s daughter), Amos Blakey Cunningham, Prentice Elder (Amos’s son-in-law), Velma Cunningham Elder (Amos’s daughter), Lillie Manila Cunningham Case (Amos’s daughter) with her husband Luther Clifford Case and son Virgil Case in back of her, and in front, Cadelia Elizabeth Cunningham Burkhalter (Amos’s sister) and Mary Elder (Amos’s granddaughter). This one also appears to have been taken in front of the Cunninghams’ old barn. You can click on the image to see a larger version. Thank you for the pictures. Amos was my great-grandfather, Dessie my paternal grandmother. You might be. I have run into the Abbeville Cunninghams in my research before. I can’t prove a link from my Cunninghams to the Abbeville ones, but Abbeville is right over the border on the South Carolina side of the border with Georgia, and there were two brothers in the Abbeville branch named Johnson and Franklin. Always wondered if my ancestor Johnson Franklin Cunningham was named for relatives. Sure did seem an interesting coincidence. I have Cunninghams from the Old 96 District. Henry Cunningham (born in PA, came to SC about 1790, died in SC 1802) and his brother Arthur (died 1825) lived in Union Co. SC. Henry had children named James (wed Mary HOWARD) William, Robert, Henry Jr., Elizabeth, Mary and Arthur. Henry’s brother Arthur had children named Charles, Betsey, Kathrine, William, Robert, Henry and Margery. Charles stayed in Union Co. SC, wed Eleanor PARR, and had daughters Margaret C. (wed 1846 to Logan B. CLINE), Eliza A. (wed 1847 to James W. RUSSELL), Eleanor ‘Ellen” (wed Henry F. MEANS, Sarah (wed 1855 to S. GIBBS) and Mary Jane (wed 1872 to Henry F. MEANS – her brother-in-law). It appears an earlier comment from Franklin Cunningham shows he is related to a Cunningham researcher named Bob Jones from Texas. If you desire more info please contact me. I am interested in getting more info as well if anyone recognizes the info above. Dana, I just read the above interesting information. Thank you for this. I would point out, however, that the above photo was taken at the reunion site, not at the site where my grandfather Amos Cunningham grew up.